Hi all, Oliver here, with our first mockup of the military screen! This mockup – which Ogi produced in Unity, meaning that the finished article will look a lot like this – shows a massive battle happening on a planet. Your forces, arrayed down the left-hand side, are ranged against the enemy, in red on the right. Each Force can have up to six units – which might be anything from ground-pounding local militia to massive starships and superweapons – each of which has its own Captain, under the command of the Force’s General. At the bottom of the screen, just above the ‘selected Force’ panel, you can see a tooltip for a unit, showing its strength (or damage dealt last turn, as this is a battle! ), its health and the damage it took last turn, its icon (currently a khaki blob, but we’re working on it) and its Captain. You have to think carefully about who to put in charge of your units and Forces – military skill can turn the tide of an entire war, but a disloyal Captain might leak secrets to the enemy, making your Force much more vulnerable to interception and attack, while a disloyal General might run off with the whole Force! As well as your commanders’ loyalty, though, you have to consider the loyalty of their troops. Every Force has a single homeworld, and the affection of the Pops on that homeworld for you and for their commander determines the loyalty of the troops they support. You can think of the troops as simply their homeworld’s Pops, abroad. Thus, if you oppress a Force’s homeworld, you’d better watch out – sedition in the ranks can lead to civil war. If, on the other hand, you have a Force from a world that loves you to pieces, you can be relatively sure that their General won’t be able to run off with them – unless they impress them sufficiently with their charisma and command ability. Even where the Force is posted matters – a Force far from their homeworld will be much less able to join in rebellions there. All these considerations – inspired by the troubles of the classical Republic of Rome – will impact on your military decisions as Emperor. Now to return to the battle screen , you can see that at the top of the screen, just under the Action Points counter and button, you can see the planetary Devastation and the balance of power. 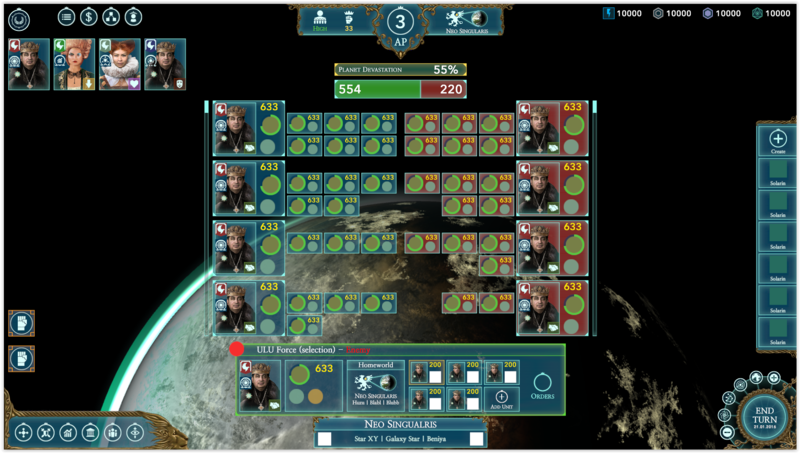 The balance of power shows which way the war is going – wars on planets can take a number of turns to complete, as each turn represents a month, creating a strategic back-and-forth as you redirect your fleets and try to prosecute or stymie an invasion. Devastation represents the horrors war inflicts on the poor, suffering population of the planet. It drives waves of refugees from the planet, dramatically depresses its economy, and outright kills Pops. Certain units will cause more Devastation than others – in particular, Xyl forces will wipe out every human they come across. Wars can have wide-ranging consequences in Alliance of the Sacred Suns, far beyond diplomacy and conquest, and as Emperor you will have to find a way to handle them – for better or worse. I hope you enjoyeed this preview of the military system – until next week, Ave Imperator! Previous post: Baby, I’ve been busy… where have you been, Steve!